Smart Intros GIGASURF 50, Comes With 1 GB Open Data And 300 MB For YouTube And iFlix For 3 Days! 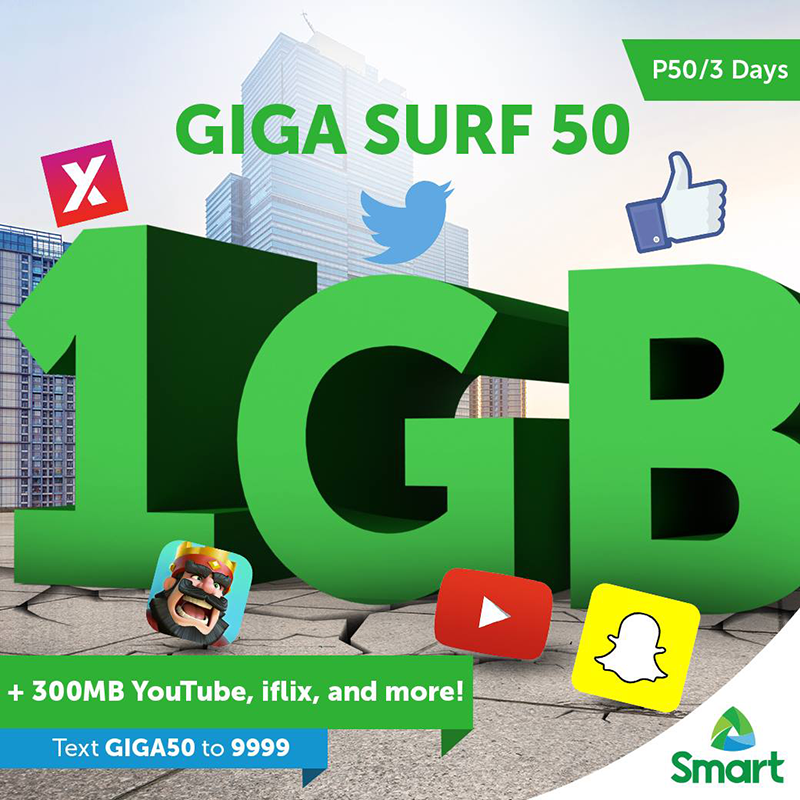 Home / news / services / smart / Smart Intros GIGASURF 50, Comes With 1 GB Open Data And 300 MB For YouTube And iFlix For 3 Days! Just in! Smart Communications Inc., just introduced their latest much improved promo called GIGASURF to replace BIGBYTES. Coming from BIGBYTES that only has 750 MB of open data, the all new GIGASURF is Smart's biggest data offering right now. It gives Smart users 1 GB open access data, plus 300 MB for YouTube, iflix, and more. That'll now enable anyone to surf the internet longer, watch YouTube and iflix without worrying about data capping immediately, and simply do more online. GIGASURF something that everyone who's doing a lot online will appreciate. All you need to do is text GIGA50 to 9999 and enjoy surfing. There's also the GIGASURF 299 for Postpaid, Bro Postpaid, and Bro Prepaid. It has 2 GB of open access volume data with FREE 1.1 GB for iflux, Spinnr, YouTube, Vimeo, DailyMotion, Dubsmash, and Skype Qik for 30 days.